Deep purplish-red, liquorice, dark berries, bay and fine spices. Smooth and suave on the palate, then full and structured with harmonious tanins. Total de-stemming, Vatting time : 20 days, Matured in vats and "foudres"
UK - Vintage 2011 - Plenty of dark fruit here with a hint of spice. the palate is both youthful and complete, though lacks a bit of charm. 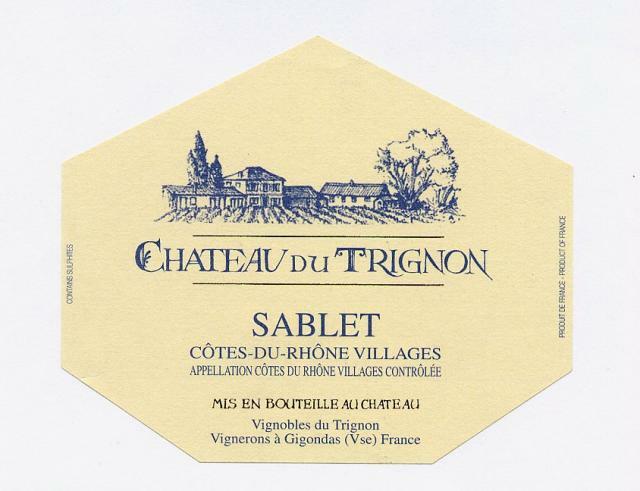 millésime 2010 The 2010 Château du Trignon Côtes du Rhöne Villages Sablet is a blend Grenache and Mourvedre that was still in tank at the time of tasting. Showing quality, traditional aromas of licorice, garrigue, pepper, and spice, as well as a medium-bodied, supple texture and a clean finish, this solid effort opens up in the glass, has plenty of character, and will shine for 4-5years.